Where do I belong? What is my purpose? Knowing where I fit in and what I am supposed to do is important to my sanity. 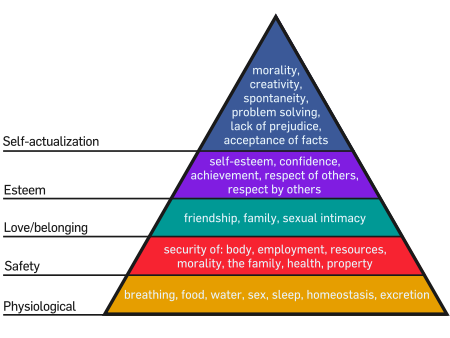 Maslow's Hierarchy of needs demonstrates this, ok so it's not a perfect model but you get the idea. For quite a while now I feel I have been in a limbo state and things not really moving one way or another, or worse, taking one step forward and two back, and given that I only like to move forward that's a challenge for me. As a kid, I was always told my mouth would get me into trouble and perhaps it finally has?! Or should I say my opinions have. I wonder if I am stubborn or simply deluded in my pursuit of life, love and happiness. Why am I now afraid to be intimate? I used to be open, flirtatious and caring, this seems to have been replaced, making me closed, aloof and uninterested - hardly appealing qualities. Why has this happened - a string of failed relationships? being hurt? taking a chance? But surely that's what lifes about, isn't it? Does everyone hurt like this? Does everyone have a pain so much it hurts to breathe? Does everyone carry the weight of their troubles with them always and forever? Does everyone question what life would be like without them? I'm not being morbid, just asking. What is the meaning, the point, the purpose of life - if not to be shared? Not understanding where I fit into this world any longer has made me wonder - is this it?! Have I had my day, my 15 minutes, did I blink and miss it? Do I need to sorry to the world to make it better? If I do, I'm SORRY! I have never been more, please just put my life back on track. I don't want much, just acknowledge me, see that I am trying, and I will do the rest - and hopefully this time get it right! Those of you who have been following me, may have noticed that not much has been posted over the last year, that's not because nothing has happened - quite the opposite, it's because I have moved away from Blogger as my main blogging tool. I will still add the odd post here and there but not as regular as I was doing several years ago. Should you like to know what I'm doing please go to my new blog on my Krysalis Photography website, to follow me there instead and catch up on all my happenings. De-U Records Over 300k Sold!!! DeUce Double - MR. 40. WATT PRESENTS: THE CHRONICLES OF KING DAVID!!! Life goes easy on me... Most of the time. A guarantee to all my photography clients…. FILM FERRANIA - New Film! FPP Epiosde 110! "One day and two days ..."
new name, new blog, new look! Oh high school... how I DONT miss you!